and Amy’s cool shoes….yeah, I know I’m a guy and as a rule we don’t care too much about fashion, and I must admit I don’t know much about fashion per se….but these were pretty cool shoes…even though I got them in transit…. Most everyone has posted about the New Rowan Yarns coming out in “Amy” colors. 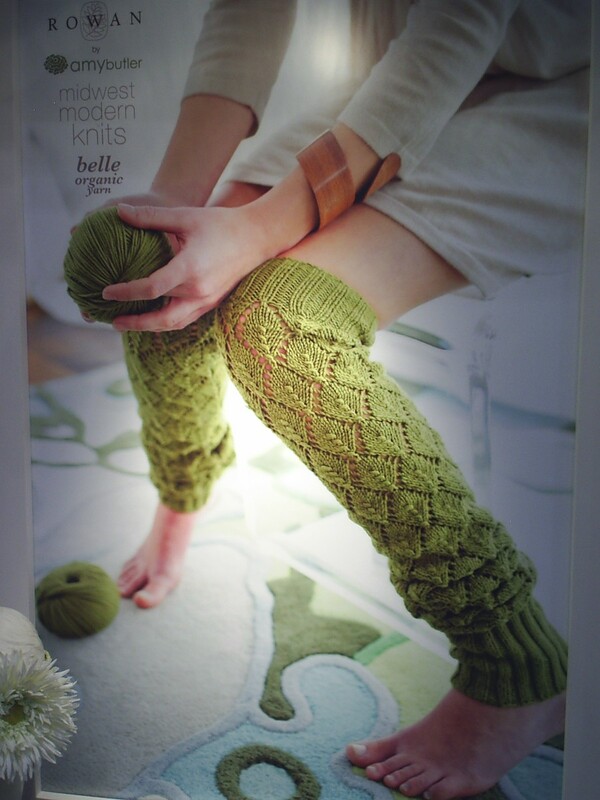 I must also admit I don’t now much about fashion….but I do know that my daughter squealed when she saw these legwarmers…call it the 80’s in me, but I thought they looked pretty cool too…. My favorite picture I think ….I know I am going to love this line….. Here is Amy’s marvelous team Mallory and Diane……Diane pretty much runs the place so Amy can be…. well…Amy…. (I can’t wait til I have someone take care of everything for me….and I don’t mean at the Nursing Home, okay??) …….And Mallory, who was pretty quiet, is the new kid on the block I think….and as sweet as can be…. 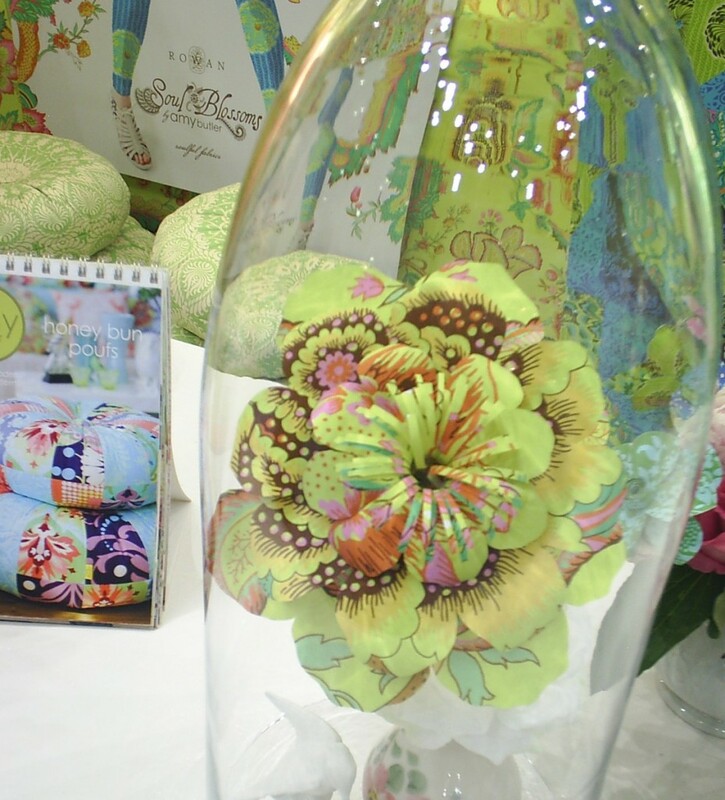 Since Soul Blossoms isn’t on fabric yet…they were showing it in paper on these great giganto flowers……. I must say talking with Amy off and on during the Market was just so wonderful…Truly she is remarkably unassuming and very “real”…. I could have been talking with her in the grocery store over the apple table in the vegetable department…not a discouraging thing about her….She was even giving me advice on some of the things I am striving to do…Not like a Know-it-all, but like a sister sharing with her brother…..I feel like I could have gone to high school with her, and even though I really barely know her, Amy made me feel like an old friend. 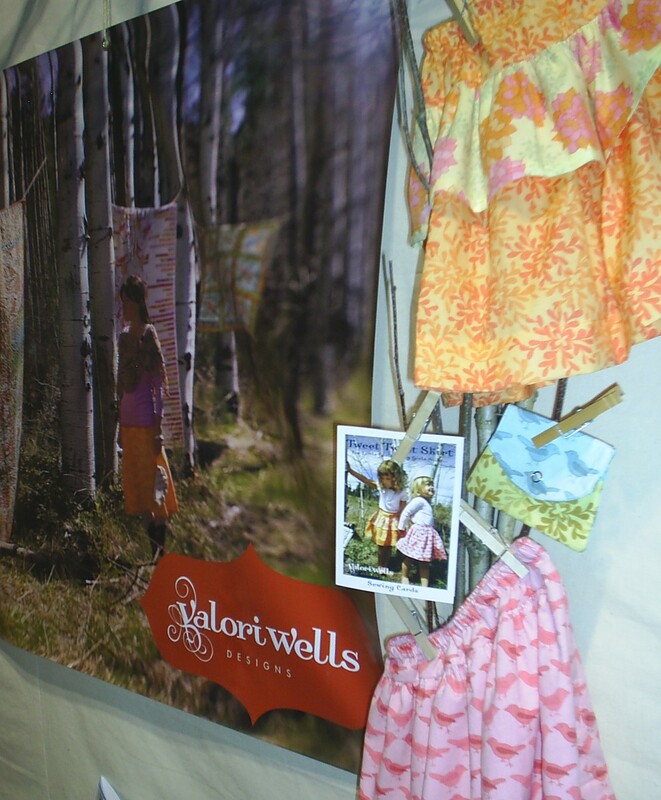 And here is just another wonderful designer who just lives one state away down in Oregon….Valori Wells. 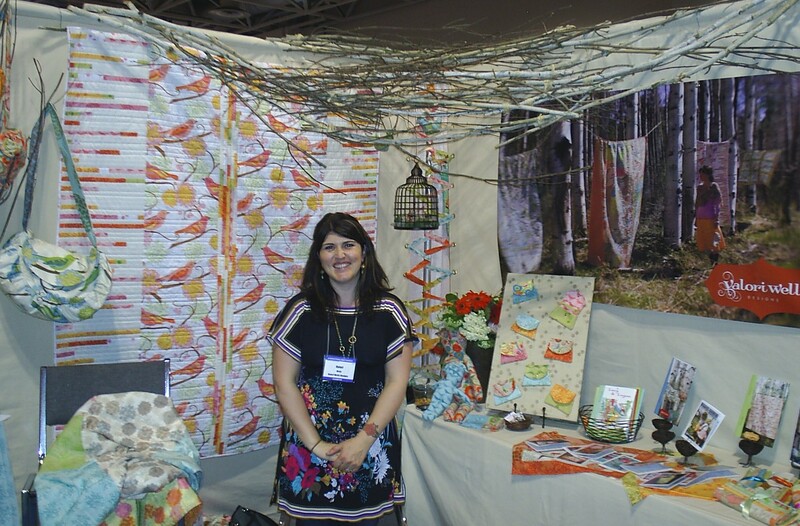 Valori has been designing for some time now, and was RAISED in the quilting business, so I love talking to her as she really KNOWS this world inside and out. 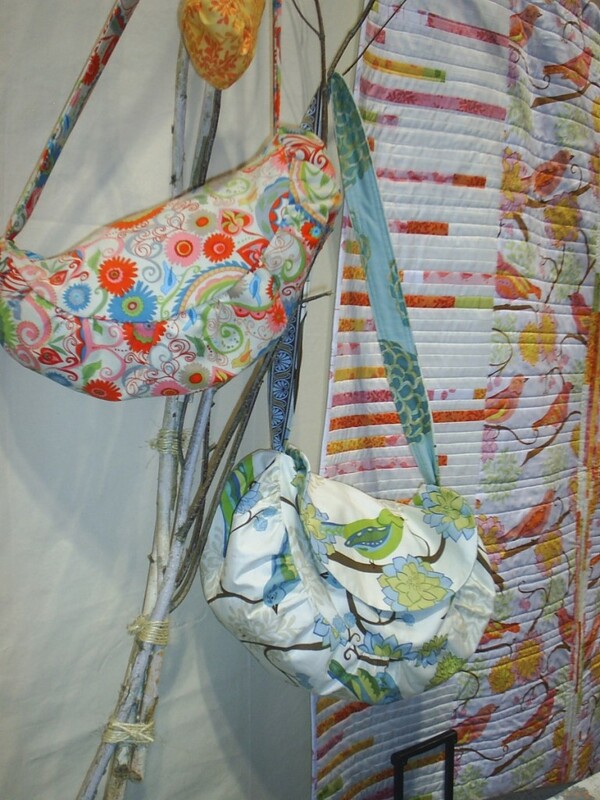 I just love the quilt behind her and these bags…. 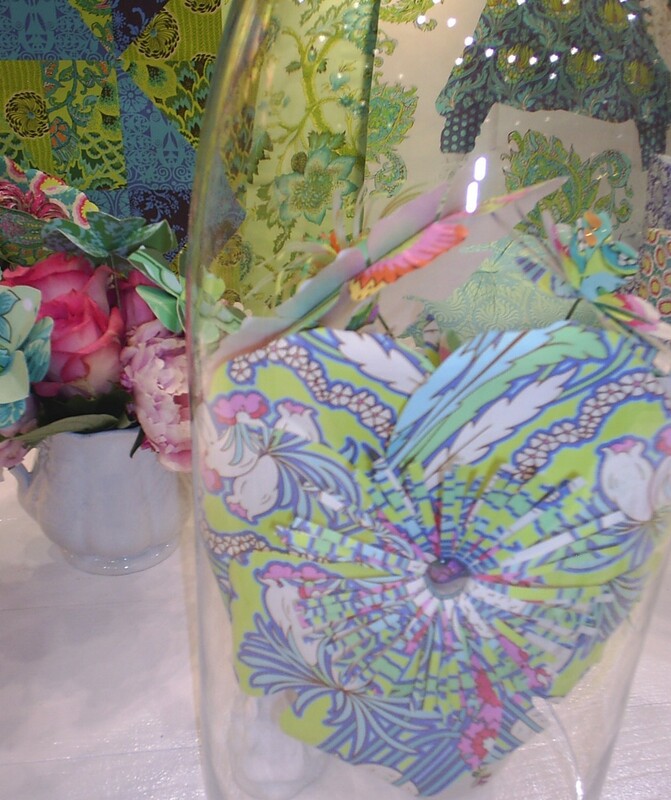 Here is her new line Nest ……..
And here is her gift to one of you!! 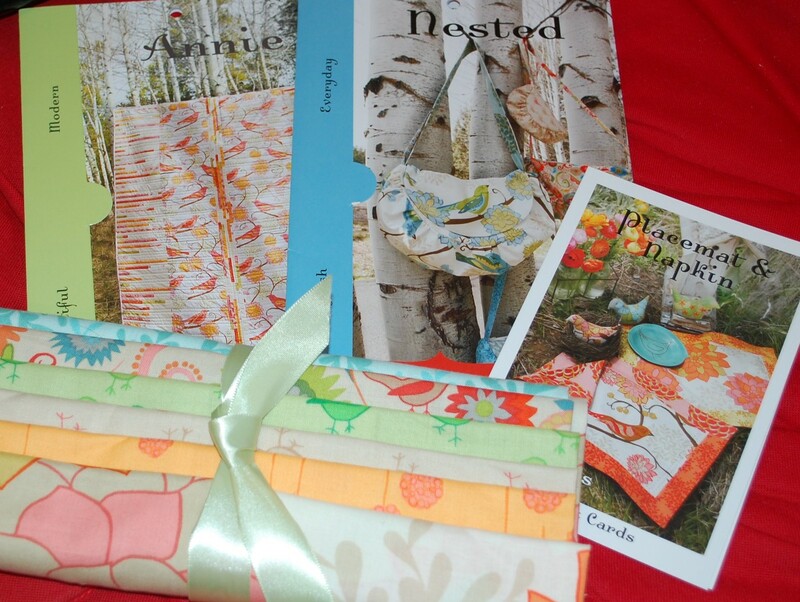 3 patterns and some Nest fabric…possibly before you and even get it locally….but I just read some of it is shipping out now…. So to win this Valori Wells prize pack….why don’t you tell me something you like about birds or a story or a poem or something else….and then when I get to 25 comments….I will start looking and reading and (here’s the tough part)….pick my favorite bird “moment”….so make me laugh or make me cry….the one that resonates with me most will win….. I am really looking forward to hearing your bird stories…. 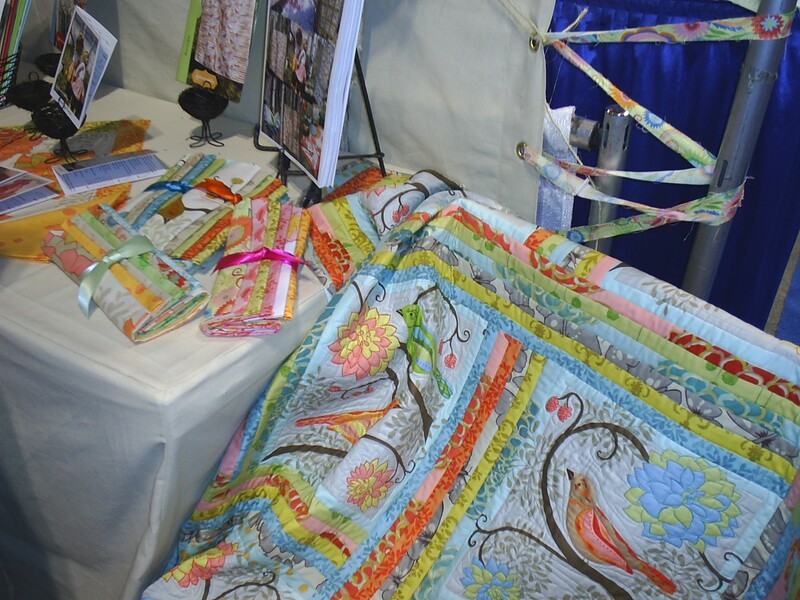 (oh, and did you notice, Amy had birds up in her booth as well)…so this was a good theme for the post, I think…. Love this post…and the showcasing of Amy and Valori. No funny bird stories here…but we do have some who live in the trees and bushes in our backyard. We love to see them on our porch getting water…they really do act like they own our porch…and that’s okay because they’re so fun to watch! 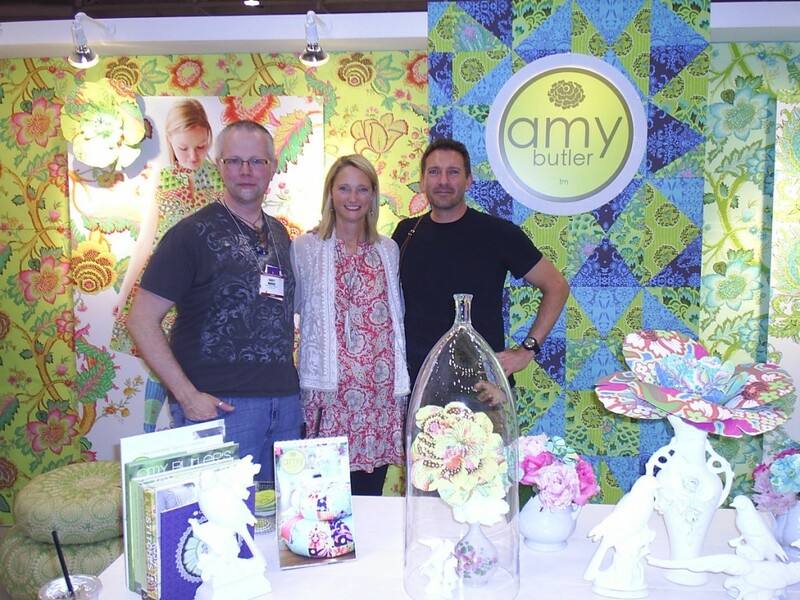 I think you got some of the BEST pictures of Amy’s booth. Mine looked like I was trying to get too much in. It is so encouraging to hear about such talented designers being so down to Earth. And of course, you are very approachable, which I’m sure helps! 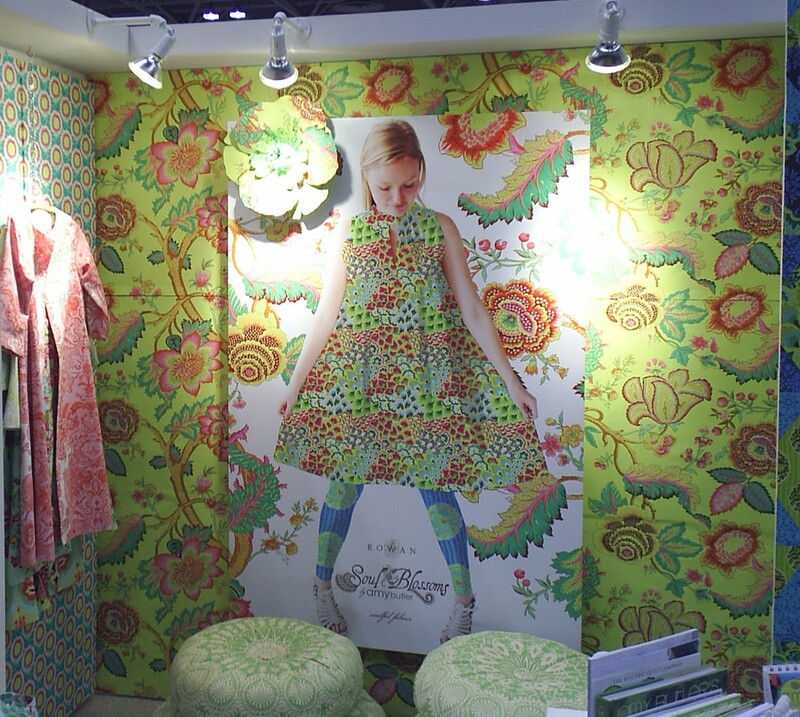 I loved Valori’s booth, too and only got one picture. Thanks for the super post! I still haven’t agreed yet, but Amy and Valori both have some great fabric that would work beautifully! nothing really funny but we love watching them! love some of the paintings of birds that Valori has done lately as well..
Bird story?? Hmmmm…… my mother-in-law is deathly afraid of birds -especially flocks of birds – like seagulls at the beach. My kids and I delight in chasing birds towards her just to hear her squeal! She also won’t put her hand inside a chicken or turkey to get out the bag of extras! Funny little woman! 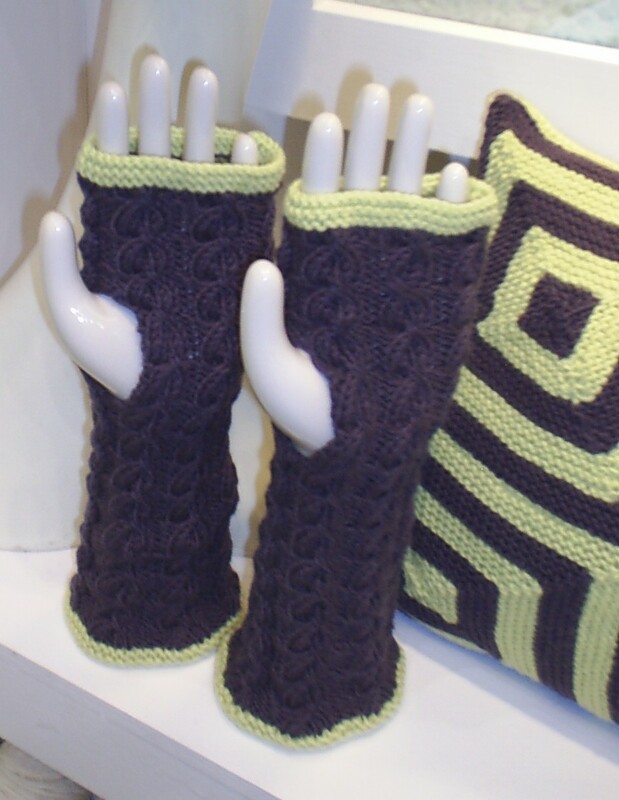 Awesome giveaway – I love Valori’s stuff (and not just because she’s from Oregon!). Sorry for another bird poop story, but it’s dear to me… Have you ever heard the old wive’s tale that it’s good luck to have a bird crap on you? I’m sure it’s just meant to make it somewhat less embarrassing… Anyway, a few years ago, my husband and I were working with a fertility doctor, trying to get pregnant. A few days after our first attempt, I went out to lunch with a friend from work. It was a beautiful summer day, so we got our lunch and sat on some steps in an outdoor plaza (Pioneer Square, in Portland, OR). Suddenly, I felt something warm splash over me, like someone had spilled a cup of soup down my back. And then the smell hit me – the most foul smell you can imagine! A seagull had pooped (or maybe barfed?!) all over the back of me, from my hair to my pants! Luckily, I had a membership at the gym next door to work and had brought my workout clothes (though the rides up and down the elevator to get them were almost unbearable – I can’t imagine if I had had to ride the train home reeking like that!). That might have been the longest shower of my life. Ah you still make me laugh, that is really great that the people at market seem to be so welcoming and we all know you will get to where you want to be…..lets see bird story….well we have an evil love bird who we got from a local animal rescue that waits for someone to stick their hand in her cage to clean it, give her food, put up a new toy you know treat her right in her huge bird condo ….and will viciously attack like a velociraptor on the set of Jurassic Park when she gets you and you finally retrieve your wrist and are cleaning your wounds she puffs up and laughs like the deep evil chuckles of a movie villain and when she misses she throws her head down and says ‘goddammit’ then shuffles off to her lair, I mean house in her cage I don’t know who taught this bird what she knows but she is entertaining even if she is not loving. Love both these new lines too Scott…thanks for sharing. When I was young (maybe about 5) I loved to play on the swingset in our backyard. One day I noticed the power lines behind our house were filled with birds, of course all watching me, so I proceeded to give them all a lesson on how to use the bars on the side of the set like the ones on the playground at school when you hook your knee over grasp your ankle and flip over and over. They watched me patiently and when I was finished flew away en-mass, class was over. I don’t know that I have a funny bird story – more horror stories like the poop one from Stacey. I think I’m a bird magnet! But right now, there are 2 mynah birds outside arguing with each other and making so much noise. I like to try to imagine what they are arguing about-I think they are “girls” & are fighting over the same “guy”. And neither one is backing down! Hmmm…. my favorite bird story. Well, I’ve got SOOOO many (no, really I do). I could tell you about the time that a bird pooped on my head, not once but TWICE and I think it was the same bird too. Or, of the time that my friend rescued an injured Turkey Vulture and after it was rehabbed by Raptors Rehab in Columbia, MO….she didn’t want to leave our friend. OR, how about the time that I sat and watched the original The Birds movie by Alfred Hitchcock and the next day, there were a whole flock of sparrows on a telephone wire as I was driving down the street that SCARED me senseless. Hmm…. I’ll pick the movie story. Which I LOVE Alfred Hitchcock and I REFUSE to see the remake of The Birds, b/c I’m convinced that it would make someone roll over in his grave! My favorite scene…..when these little itty-bitty birds peck their way through a BIG wooden door. Looks like you had an totally uber-fun time at market! *me trying to NOT be jealous* LOL! Okay, here’s my bird story. Growing up, we had canaries and finches. Canaries were in one cage and finches in the other. One spring day my dad took the birdcages outside to clean them out. He pulled the tray out of the canary cage, hosed it off, put the new paper in and put the tray back. Then he pulled the tray out of the finch cage and went off to hose it off. When he came back, the pinches were sitting in the bush nearby! What he didn’t realize was the tray in the finch cage was the whole bottom of the cage. The canary cage had another bottom underneath the tray. Tray as hard as we could, we couldn’t catch the finches and they all flew off. My mom used to tease him about this for a long time afterward! but I don’t know how in the helican. Hope you enjoy it as much as I enjoy following your creative spirit. Hymm. My favorite bird story? I love birds and how they sing, especially the sweet little wrens. But what stands our in my mind right now is a Seagull that just wouldn’t turn down some free handouts at the beach! This guy kept eating, kept eating, kept eating. You could see his size get bigger and bigger. He’d run down to the water to get a drink, but come right back to get more free food for fellow beachmates giving him food. He ended up looking like a chipmonk with very stuffed cheeks, but with wings! And the only reason he stopped is everyone ran out of food to give this guy! Hymm. I also grew up where a white turkey (runaway from a turkey farm) would sleep on the back of the horses at my grandfather’s farm. As a So. Cal. girl, this always quacked me up! I don’t have any good bird stories unfortunately, but here is one of my favourite Emily Dickinson poems. I don’t think I am allowed to tell you about the time that my mom was walking down the street while wearing sun glasses and somehow a bird managed to poop in her eye, so i’ll tell you about the bird quilt I am making for a friend’s mom. She bought her mom a BOM program about 10 years ago. Her mom started paperpiecing all these amazing birds. Unfortunately she has Parkinson’s and couldn’t finish. 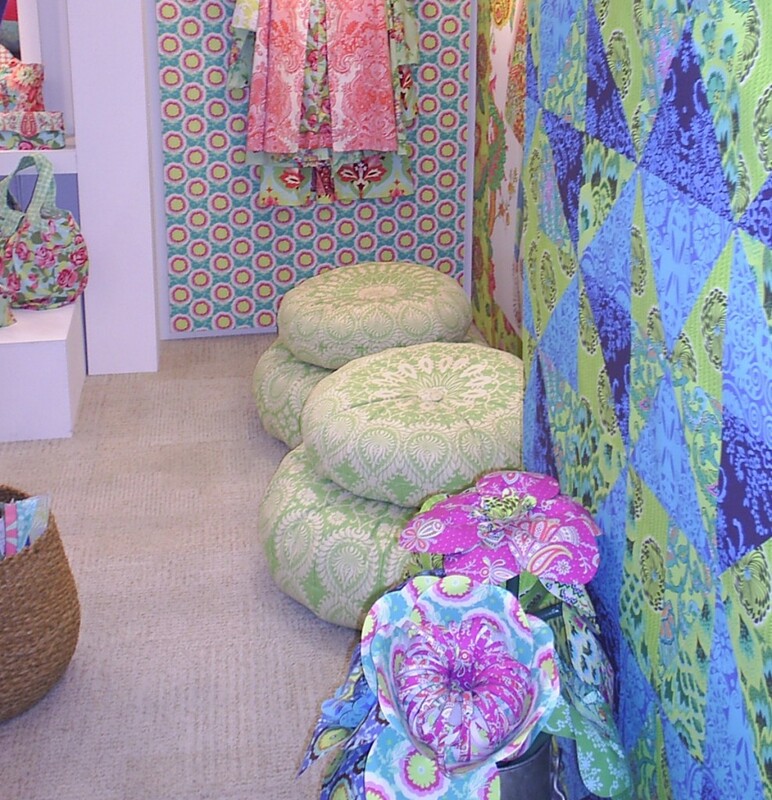 So for many years the fabrics and blocks sat unfinished even though I offered to do the work. two years ago my friend passed away and her mother asked if I would finish the quilt for her. I accepted and when I can I work on the blocks and sashing. Its really hard because I think of my friend with every stitch. I am resolved to finish the top before the end of the summer. now that I have my new bifocals I can again see clear enough to finish the applique. I’m not really a bird person, but after piecing these fairly accurate blocks I can now identify 12 different birds. Hi Scott, I can’t take credit for this one, but it did make me laugh out loud…! When my husband and I were first married, we lived with in his parents house while they were in Africa for 2 years. Before his parents left, some birds had built a nest in the corner of the covered porch right next to the garage door, above where I parked my car. They left explicit instructions to allow the birds to build their nests there. Aside from having the front of the house constantly covered in bird crap, every day for 2 years I got dive-bombed by attacking adult birds as I walked under the porch to my car each morning. As much as we loved seeing the little baby birds learn to fly, I was never happier to move into our apartment to get away from those attack birds! My Grammy had a gorgeous flower garden with tons of bird feeders in it that I loved to help her tend as a child. When I was about 8 I was helping her outside while wearing flip-flops. Sure enough a bird pooped RIGHT between my toes! Do you have any idea what slimy white with black flecks bird poop feels like between your toes???? That day altered my view of birds forever. I moved from the side of my Grammy to the side of my Poppy who was forever scraping and scrubbing the hardened to cement poop off every square inch of property they owned. This is a make you cry bird story. Or make you think I”m crazy story, either one, take your pick. When I was a little girl, we always went out to eat every Sunday after church. One Sunday as we were driving to the restaurant, my dad hit a bird. Or probably the bird flew into the car. At any rate, I can still remember turning around and looking out the back window of the car, and seeing the bird flipping over and over on the highway. I remember sinking down into the seat and just sobbing. Mom said I wouldn’t even eat when we got to the restaurant. I’ve always had a soft spot for animals, but for some reason this bird scenario still sticks in my memory like it was yesterday. I was at market and it’s so fun to see things through another person’s eyes. Thanks. Now on to the birds. Well, ducks really. This morning when I was eating breakfast, I asked my husband what was that out on the lake which was smooth as glass. He couldn’t tell either, so I got the spotting scope and it was momma duck with 13, yes 13 babies following her and trying to climb on top of her and swimming in front of her and all around her. It appeared to be their first trip away from home because it looked like chaos. We watched until we couldn’t see them any longer. I love where I live. Whenever I see birds I think of my Aunt Helen. She loves them. I mean…. obsession. She’s 81 years old and has been collecting birds for 3/4 of her life. Her 1400 square foot house has at least 8 bookshelves or curio cabinets filled with bird figurines. She has to have 2 Christmas trees — one is just for the bird ornaments. She has that bird clock that was on sale on tv a few years ago — each hour you hear the call of another bird. My hubby and I got one from someone else for our wedding. We gave it away. She loves it. At Christmas time, all of her gifts are either new clothes, items for her kitchen, or birds. Sometimes, it’s clothes or items for her kitchen decorated with birds. 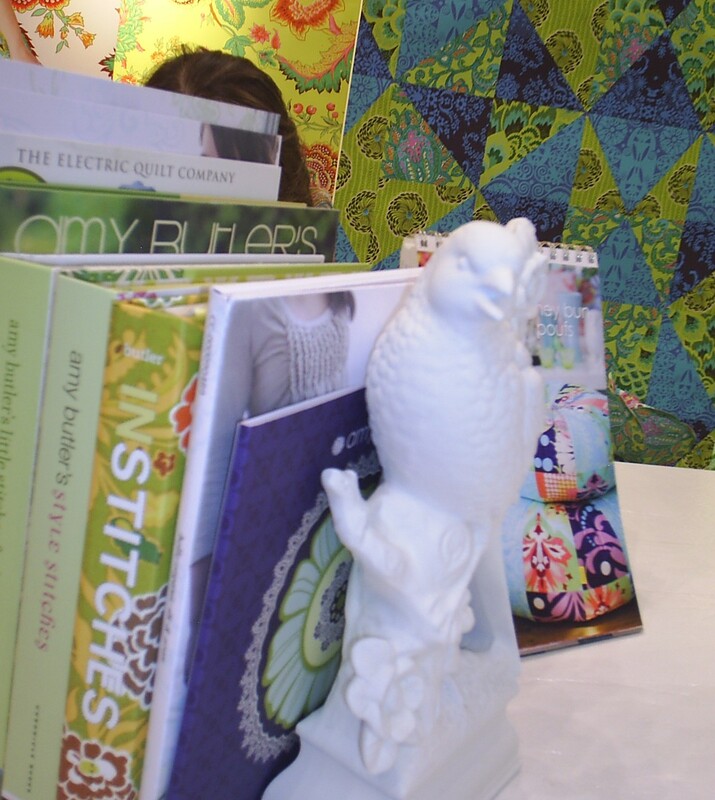 Valori’s Nest has birds that are much more my style! 🙂 Thanks for the chance to enter! What can I say about birds! There are so many unique species that give inspiration from both color and shape. I’m decorating a new home we just moved into and I have bird prints, bird statues, bird bowls, bird pitcher — I’m just bird crazy. Thanks for sharing your interesting post. What fun seeng market through the eyes of others! It seems a color intoxication! I have always loved birds. As a child, I would day dream about how I’d love to be a bird; to fly over the earth and see things from that perspective…yes, I was a bit strange, but really! Think about it! Some of my real nighttime dreams I’d be swimming through air…don’t know if that was my desire coming through even in the subconscious? Oh, and I do remember the first time someone got ‘bombed’ from bird poop! I didn’t realize that could be a reality, so from then on, I always watched birds from an angle and NOT directly UNDER!!!! Ahh Birds! I love birds! I grew up in the country and there was no better sound in this world than waking up to the birds singing they always sounded so happy. It just put you in a good mood for the rest of the day. Thanks for the great giveaway. I was raised in Washington but Until I moved to Oregon I don’t think I had a real appreciation for birds. We lived in a house on the lake about a half mile from the ocean. I didn’t have many friends when we first moved so my Daughter and I could watch the herons and birds all day. We had one heron that was always close to our house and we could watch him flit around the lake and fields all day long. He could actually hold so still that you really didn’t notice him unless you were really really looking. My Father-in-Law spent hours studying and noting the habits, colors, and size of all the birds at the Coast. He then carved the most beautiful decoys you have very seen. When you sit down and read his notes you could tell by the detail he loved the birds. When he found birds that had died, he actually brought them home, took measurements, weight, colors, everything he could think of before burying them! He loved the birds and wanted all his carvings to be as accurate as possible. He was truly at peace living there at the lake house with all the birds and wildlife around him. I was a lucky woman to be able to spend the last 6 months of his life there with him, my husband, 1 year old daughter and my brother-in-law. I got to witness his appreciation of the birds and truly get to know him. I am still watching birds out my window but now I do it on 80 acres in Jewell, Oregon. My new favorite is an Owl that is so beautiful he brings tears to your eyes. To watch him fly with that 6+ foot wing span is a sight to behold. I wish I could tell this story like you were living it with me because it was truly special. Love the pictures from Market – we enjoyed our trips to market several years ago — would love to go again. For about ten years we have had barn swallows nesting on our porch. The nest is on the light across from the door, which gives us a great view. However, for Christmas I gave my husband a bird cam so we could have even better views of the birds. They returned this year and relined last years nest, etc. However, last week they abandoned that nest and built a new one — on TOP of the bird cam — Now we can’t see them at all from the doorway! Mirrors may be called for! I think the best bird story I have happened when I was about 8 years old. My cousin (who is 1 year older) and I were playing in my grandparents basement. They had an old wood burning stove that was in the center of the room. As we were playing I heard a noise coming from inside the stove. I looked at my cousin and asked, “Did you hear that?” She listened a little bit and agreed that there was indeed a noise. In true horror film nature, we then opened the door to the stove and screamed when a huge crow flew out! We were both freaked out and scared that we would be in trouble but by that time our grandparents and parents came running down the stairs to see what we were screaming about. Then my grandfather had to chase the crow all around the basement and somehow convince it to fly up the stairs and out the back door. To this day my cousin is still terrified of birds – but this story always makes me giggle! I had a real bird cage on my porch and had a fake bird in it. My grandson was so worried one day when he saw the bird because it wouldn’t move or sing. He didn’t know it wasn’t real.